Referral Bonus: Refer someone that books a cruise through me and you will both get a $10.00 Starbucks gift card when they complete their cruise deposit. You can go to coffee together and talk about your cruise plans. Don’t like coffee? Just tell me. We can work something out. Contact me or visit my website at http://www.PixieDustAdventures.com for a free quote. Have you been thinking of booking a Disney vacation for your family? This is the perfect time to book with this special bonus offer. 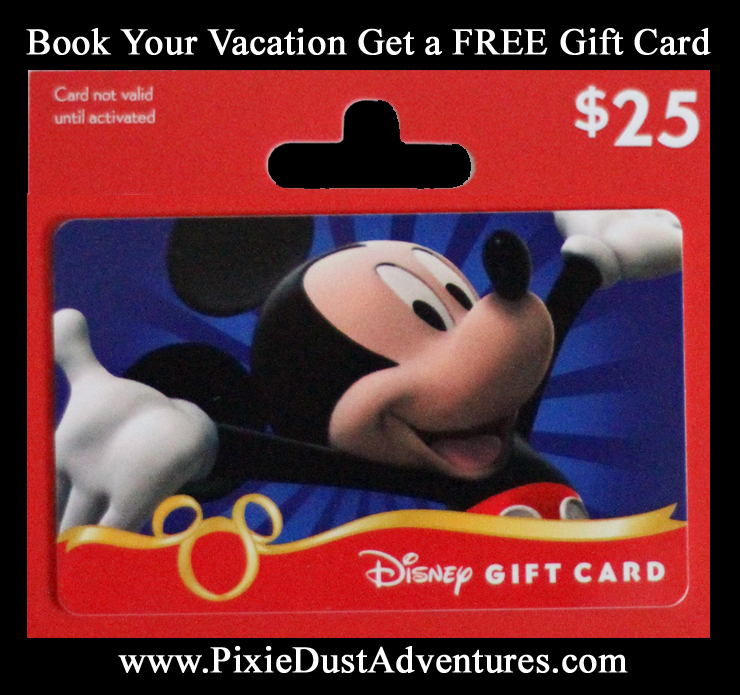 Book your vacation, through Melissa Mathies – Pixie Dust Adventures, during the month of September, and get a FREE Disney Gift Card for your next Disney World, Disneyland or Disney Cruise Line vacation. Take advantage of Disney’s fall room discount, paired with this offer, for a really great deal! With special shows and parties, the holidays are the perfect time to visit the Disney Parks. If the holidays are sneaking up on you now, you can always book a 2016 vacation. Melissa can offer specialized planning assistance for your hotel stay, dining, Fastpasses and more. The best part is that it doesn’t cost you anything extra over booking directly through Disney. At the time of travel, you will receive your Disney gift card to take with you and help pay for extra souvenirs or even a delicious snack. **A package minimum of $2,500 is required to qualify for a $25 Disney gift card. Cards in other amounts are available for other packages. You will need to book or transfer your Disney vacation to Melissa, between now and Sept. 30th 2015, in order to be eligible for this special gift card offer. This gift card CAN be combined with any special offers that Disney has available. If there are no current special offers available, Melissa will watch over your future vacation for any offers that are released through Disney, and automatically apply them to your package. It all starts with a free quote!